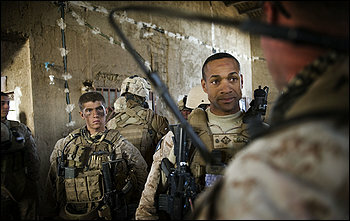 Marines battle IED’s in Aftganistan…..
And can inflict a lot of injuries…..
And a psychological toll on troops…. The Army and Marines have spent a lot of time trying to deal with them in Afghanistan…. Here’s a piece on the Marines EOD efforts…..
A U.S. Marine Corps sergeant jumped from a Mine-Resistant Ambush-Protected vehicle last summer to inspect a suspicious clump in the dirt along the side of the highway linking his operating base and the combat outpost the convoy was headed to. He inched his way to the patch of ground with a metal detector. The marine had good reason for caution. Helmand Province is infested with improvised explosive devices (IEDs), found along roadways and footpaths that Marines and Afghan security forces use during dismounted patrols. To understand how prevalent IEDs have become, one only needed to look at a watch. The 10-mi. drive between posts was taking more than 2 hr. The sergeant’s countermeasure might not be as useful as expected—camp scuttlebutt after the death of a marine by an IED days earlier claimed the explosive was packed in a rubber cylinder so it could not be detected by metal detectors. IEDs in Afghanistan have doubled in the last year, USMC Lt. Gen. Michael Oates, director of the Joint Improvised Explosive Device Defeat Organization, told Congress on March 17. According to a Defense Department tally, more than 8,000 IED incidents were reported in Afghanistan in 2009, compared with almost 4,000 in 2008. Insurgents, moreover, are turning to “low- or non-metallic-content, fertilizer-based explosives, which frustrate detection,” Oates said (DTI April, p. 34). The effects are potent. According to the Brookings Institution, IEDs were responsible for almost half of the 312 U.S. troop deaths in Afghanistan in 2009. The average has stayed steady this year, with IEDs claiming 39 of the 79 U.S. troops killed as of late March. “One of the striking things about Afghanistan is the IED threat is particularly brutal,” says Brookings military analyst Michael O’Hanlon. The labyrinth of dirt roads in southern Afghanistan makes planting bombs easy. The agrarian nature of much of Afghan society means ammonium nitrate fertilizer, which cranks up the potency of IEDs, is readily available despite a ban by the Afghan government. Recent operations in southern Afghanistan have pushed troops into new territory, and insurgents fight back with IEDs, says Dakota Wood, an analyst at the Center for Strategic and Budgetary Assessments of Washington. 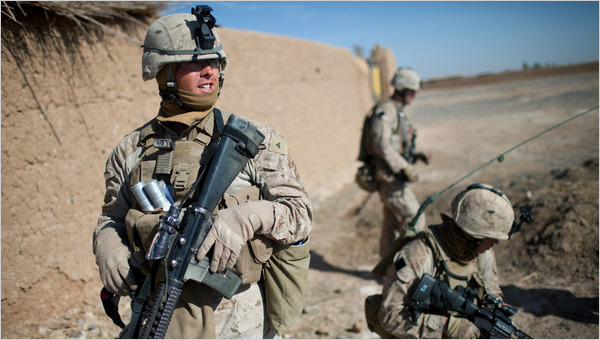 The use of plastics or fiberglass components “shows an advance in devices that are less detectable,” he adds, and indicates insurgents are learning and adapting……..
Marines battle IED's in Aftganistan….. The fighting continues in Marja, Afghanistan….. The Marines, Afghans and NATO forces continue there push into the heart of the Taliban held territory…..
Here’s part of the story……Here’s the link…..…..
Afghanistan — Marines and Afghan units converged Sunday on a dangerous western quarter of the Taliban stronghold of Marjah, with NATO forces facing “determined resistance” as their assault on the southern town entered its second week. The Marjah operation is a major test of a new NATO strategy that stresses protecting civilians over routing insurgents as quickly as possible. It’s also the first major ground operation since President Barack Obama ordered 30,000 reinforcements to Afghanistan. In a setback to that strategy, the Dutch prime minister said Sunday that his country’s 1,600 troops would probably leave Afghanistan this year. Prime Minister Jan Peter Balkenende spoke a day after his government collapsed when a coalition partner insisted the Dutch troops leave in August as planned. Fighter jets, drones and attack helicopters flew over Marjah, as Marine and Afghan companies moved on a 2-square-mile (5.2-sq. kilometer) area of the town where more than 40 insurgents have apparently holed up. Insurgents are putting up a “determined resistance” in various parts of Marjah, though the overall offensive is “on track,” NATO said Sunday, eight days after thousands of Afghan and international forces launched their largest joint operation since the Taliban regime’s ouster in 2001. Sometimes you get lucky…..this Marine stepped on a IED and lives to move on…..
Here’s the link. for the rest of the story……..